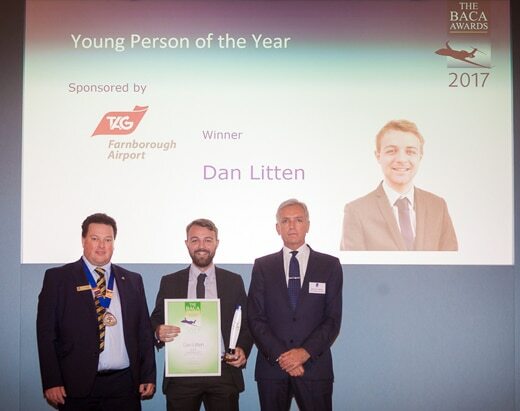 Yesterday at the London Guildhall, members of The Baltic Air Charter Association (BACA) and their guests gathered for the association’s autumn lunch and the annual BACA Excellence Awards ceremony at which Dan Litten, Hunt & Palmer Cargo’s youngest team member, was the proud recipient of the “BACA Young Person of the Year Award”. This coveted accolade is awarded to a young person under 25 years of age who is working within the air charter industry. Nominees are submitted to BACA by their peers and a winner is subsequently chosen from those submissions by the BACA Council panel, taking a number of factors in to consideration, but in particular the example and dedication that the young person has shown in their career to date. Litten joined Hunt & Palmer Cargo Charters from a freight forwarding company but at that time had no air charter experience to speak of. Although his cargo background provided a good launch pad in the world of cargo charter, there was still a very steep learning curve, which he embraced completely.